For those who have been following me on Instagram you know that I recently changed my account name from @tinadvincula_ to @cofficehunter, and for a good reason! Let this post be my first ever #cofficehunter dedicated article in this blog, 'cause you'll definitely see more of this! Not all cafes are created equal. That's why I'm on the hunt for these best ones out there, starting from the area near my place, Quezon City. This is prolly my favorite city ever. It's a city bustling with a torrent of people from different classes and backgrounds that gives you a glimpse of who the Filipino people are, how they live, where they go, what they eat and drink, what makes them happy. It houses most of my memories as I studied here from Grade School to College, so it's just right that I begin "coffice hunting" in the place I know most (next to where I actually reside). PS. Add to this list by submitting a coffice HERE! Right beside a culinary school and one of the biggest fast food chains along Katipunan is this cafe slash gallery that prides itself on being a coffice. 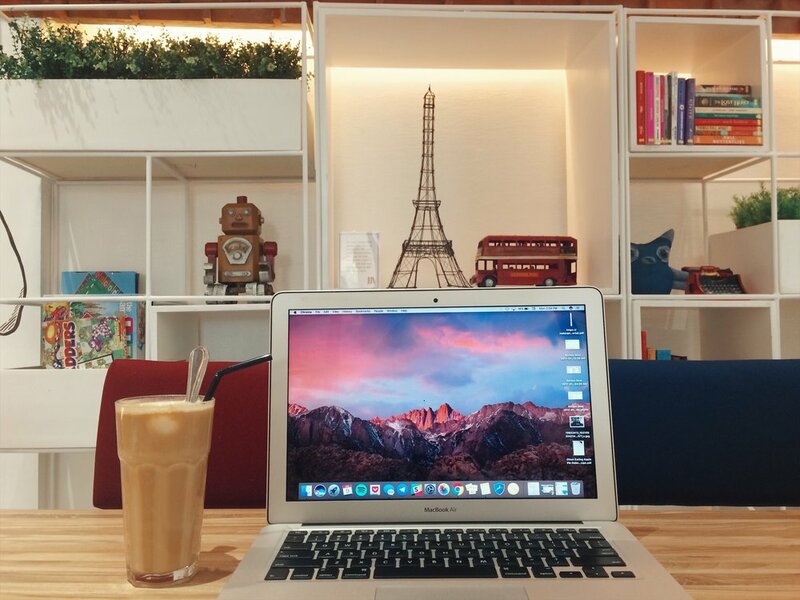 It's a rare feat, tbh, as most cafe owners don't want you to spend 5+ hours in their cafe hogging their electricity and fast wifi, but this cafe encourages you to feel at home ("at the office?"). Bask in the artwork, sip on the Kape Sua Da, and munch on the Bacon Sisig and Egg Rice Meal for a filling lunch break before you go on beast mode with work. It was love at first sip at Negative Space Cafe when I ordered their Japanese Coffee. While you do get occasionally disturbed by the barks of their resident Akita, it's nothing that will ruin your funk. I particularly like that there's a study table design for those who prefer to study or work alone. It's charmingly eclectic and I found myself going back here whenever I'm the area. I'm not particularly a fan of Cup Fiction's hefty price tag so I make sure that when I go here my wallet's ready. I found this place perfect for meetings and work-play coffice sessions as there's a collection of books waiting to be devoured. Must-tries are Oliver's Grilled Cheese (the best I've had so far) Salpicao, and everything in their Coffee by #YKW menu. Another coffice filled with books--but this one's conveniently located in Eastwood City. Unlike their Mckinley and Tomas Morato branches, this one's more spacious. I enjoy the peace and quiet from 2-5pm and that's also when I'm most productive. I highly recommend their coffee list if you're up for a strong kick but if you prefer something lighter, smoothies or blended drinks are your pick. If you want to unwind a bit after a long day at work, grab a beer and a basket of wings, you deserve it! This coffice holds a very dear place in heart because it's where Hans and I had our first (blind) date. We go here once a year to celebrate that specific date, and the last time we came here, their al fresco seating was swarming with people on their laptops. And I understand why-- their wifi's pretty fast. To add to that, the food and drinks are awesome, and the place looks like (or is) a home converted to a comfy and colorful cafe. A submission from (one of) my most trusted #cofficehunter and friend, @RafRoads, who believes that this cafe deserves a shoutout. I happily adhered when I saw the place. Flowers were falling from the ceiling, there were inspiring quotes all over the place, and sights of quirky items were very Instagrammable. Trust me, if you work from home, ambiance is crucial to your productivity. Aside from those seemingly pointless things is a very useful feat--power outlets, they're everywhere! Rest assured you'll enjoy this cafe whether you're working alone or talking to your significant other on a romantic date. And that's it! Please note, these are just the best coffices as of the moment. I'll definitely add to this list as time goes by. See the rest of the coffices ni Quezon City in this map. Add to this list by submitting a coffice HERE! *Please note that I'm not paid whatsoever to mention these cafes on my blog. Even if I am, I will still be honest about my review.